Ocean Acidification Background Context | Watts Up With That? ← Humans Are the Superior Species with Every Right to Be on Earth. We are Not ‘Unnatural’ as Environmentalists Claim and the IPCC Assumes. Is there a missing byline, ie Rud Istvan’s? Thank you for a clear and easy to understand article on the pH question. I will post a link to it on my blog. I’ve got one that stops them in their tracks. You’re welcome to try it on a Warmist you know. Simply point out that before the ocean can become acidic…it must first become….’fresh’. I just love the look they get! “Fresh” as in not salty? A major task for humanity, much harder than halting carbon dioxide atmospheric increase. But I do recall President Lyndon Johnson campaign promise in 1964 to “de-salt the oceans”. After winning the election, he immediately forgot this non-issue. Phytoplankton calcification in a high-CO2 world. Not only Dover, but almost the entire south coast of England. The chalk stretches many miles inland and all the way west down the south coast way past the Isle of Wight that I know of when I lived there. Much of it has been washed away so much so that there now is the Isle of Wight. Scleractinian corals evolved in the Triassic, after the end Permian mass extinction event. They were hit hard by the end Triassic MEE, but bounced back. This despite CO2 concentration of ~1000 ppm before the end Triassic, and perhaps 2500 ppm across the boundary with the Jurassic Period. The MEE at the Triassic-Jurassic boundary (TJB) has been attributed to elevated CO2 from the Central Atlantic Magmatic Large Igneous Province (CAMP) eruptions, the initial rifting which led to the opening of the North Atlantic. So, even should humans enrich our air with 600 ppm of plant food, vs. the present paltry 400 ppm, no worries. Bear in mind that reef-forming corals form symbiotic relationships with photosynthesizers, which would benefit from more plant food dissolved in the seawater around them. IMO decreased seawater alkalinity from CO2 added to the air and presumably ocean surface by the CAMP is not a convincing explanation for whatever losses scleractinians (stony corals) might have suffered during the end Trisassic extinction. For, among other reasons, precisely the fact you adduce. Just reporting what is getting published. There’s a lot of published research…that has mysteriously disappeared from the internet. Thanks! As with news in the USSR, you can usually be sure that reality is just the opposite of contemporary consensus “climate science”. Sad and terrible that real science of the past has been consigned by the Ministry of Truth to the Memory Hole. We live in Orwellian Times, beginning in 1988 rather than 1984. Southern Hemisphere researchers didn’t find the alleged spike in CO2 from NH sites. Any links at WUWT should always be to free-access sites like academia.edu or researchgate if possible. I recognize that this is often difficult since “climate scientists” in contrast to virtually all other disciplines tend to shun such sites. “Obiter dictum. We acknowledge that seawater is basic and cannot truly acidify (pH<7). But that is a losing semantic quibble, not a winning skeptical argument. The generally accepted linguistic convention—for better or worse–is that lowering seawater pH means ‘acidification’. There is no doubt that adding dissolved CO2 does lower pH. The relevant questions are how much and whether that amount matters." SM, TY. Per our recent lunch with CtM, will continue to try to elevate WUWT. Must beg to differ. Science requires precise and accurate terminology. In chemistry, “acidification” means “to make or become acid, or to convert into an acid”. The grossly incorrect phrase “ocean acidification” is intentionally misleading and should be rejected. “Climate science” is debased. The rest of creation has been coping with such wildly varying concentrations of carbon dioxide long before they evolved a single brain cell. That has been my understanding since I took inorganic chemistry quite a long while ago. But it’s also true that “acidification,” and not “neutralization,” has become the recent linguistic convention and there’s little point in quibbling. Last I heard, the score was Windmills 1, Don Quixote, 0. Now all this has given me a queasy stomach, and I must go basify it. Steve, what things are called is NOT a “semantic quibble”. It is important in the fight for understanding, which is the reason that people on the other side constantly refer to skeptics as “deniers” … because it makes a difference. And while I understand folks in the opposition using the term “denier”, as well as the term “ocean acidification”, and the term “climate weirding”, their using those terms is absolutely NOT a reason for us to use those terms. The term is a shift from “global weirding”, coined by Hunter Lovins, co-founder of the Rocky Mountain Institute and promoted by Thomas Friedman. It originated about a decade ago. That term was suggested because “global warming” was inadequate as a descriptor for the outcomes, in some people’s minds. Both “global weirding” and “climate weirding” are mechanisms some communicators choose to bypass the irrational responses a subset of people have to “global warming” and “climate change”, where negative connotations have been created by climate disinformation campaigns. A lot of people will read about or watch something that’s ‘weird’ because they hope to be interested, titillated or excited. Naturally, climate change deniers such as Anthony Watts and Judith Curry have castigated the communicators for ‘abandoning’ ‘global warming’ as a term. Their pretense is that warming isn’t occurring so that term had to be left behind, which is BS of course, but typical of them. As others on the page have pointed out, Katharine Hayhoe is using the term to great effect in her series of videos and public speaking engagements with groups skeptical of warming. So yes, Steve, as you point out, we need to discuss the “meat”. However, that does not mean we should use improper and highly slanted terminology, whether it is “climate weirding” or “ocean acidification”. It’s so commonly used that I’ve read that dictionaries consider it correct. It’s analogous to using the term “warming” to describe what’s happening even in a very cold environment. That’s its denotation. But its connotation—i.e., its suggestive associations— is different. The word suggests to the 97% not familiar with its limited denotation, turning into acid. So its use should be avoided in the context of AGW, to prevent misleading and alarming the audience. During a period of ocean warming, the notion that rising atmospheric CO2 increases dissolved seawater CO2 is literally the tail wagging the dog. Even when modified Henry’s law is taken into consideration as explained in the acticle by John J. Carroll and Alan E. Mather, “The System Carbon Dioxide-Water and the Krichevsky-Kasarnovsky Equation,” Journal of Solution Chemistry, vol. 21, pp. 607-621, 1992. The bottom line is that the amount of CO2 dissolving the water still depends on temperature. Cool water more CO2 dissolves, warm water less CO2 dissolves. As we come out of the last ice age (as in right now) one of the main reasons atmospheric CO2 is increasing is because the warming oceans are degassing CO2. As ‘we’ came out of the glaciation. Came. This explanation is not working any more, like during the last millennium. The recent increase is due to continuous large human emissions that would take decades to essentially go away, if we stopped emissions, i.e. using fossils, now. I believe (and this just an opinion) that emissions will not be stopped, as that would kill more people than unmitigated, adapted warming would, but that it is still wise to pick low hanging fruit such as increase production of nuclear and pumped hydro. Alpine style glaciers have been melting worldwide. Many are still in retreat. Arctic ice (while recently stable) has been in retreat for several decades. The Titanic was sunk by a an iceberg field supposedly calved from Greenland’s ice sheet. Sea level is still rising (although not as fast as the alarmists claim). The oceans are still warming, and degassing CO2. The percentage of the increased CO2 in our atmosphere that is the result of human activity is a subject of fierce debate, but it’s nowhere near 100%. It’s relatively small. The vast majority comes from natural sources, of which the oceans are by far the largest source. well said willis. rather than terra firma resituating implement, i am a spade kinda guy. Bless you, Willis. it is important to use the correct terminology, if only to really know what one is talking about. “Acid” is a scare word. People have a vague idea about the destructive effects of concentrated acids (fewer have any idea of the destructive effects Drano, i.e. pure sodium hydroxide, a powerful base in aqueous solution). The climunist Left is masterful at using language to drive emotion. 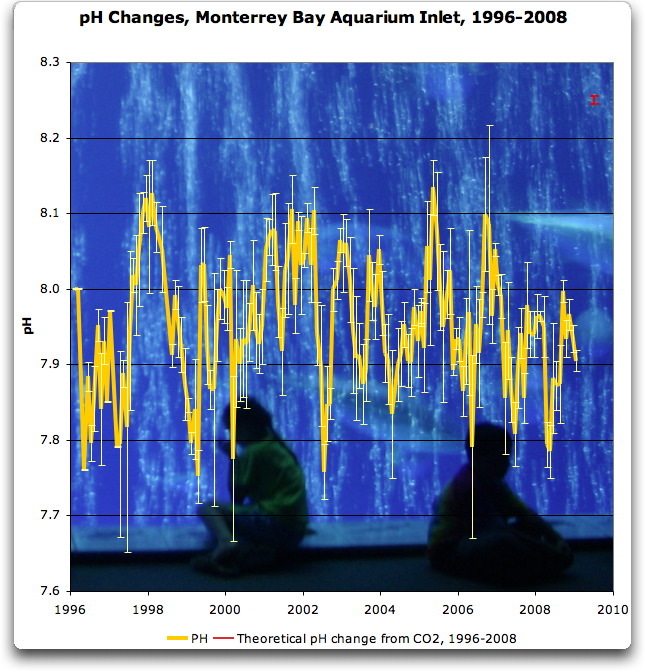 Ocean “acidification” is a deliberate choice, but is absolutely incorrect. When it comes to water and its content of hydrogen ions, there are three choices: 1) Acid, with a pH less than 7.0; 2) Neutral, with a pH of exactly 7.0; and Base or Alkaline, with a pH greater than 7.0. Starting with a basic solution, one can slowly add an acid and bring the pH down from its original value. At some point, the solution becomes neutral. Only then can it become acidic. The correct terminology is “ocean neutralization.” That may be scary to some, I don’t know. But it’s right. Although ocean ‘acidification’ probably was heralded by alarmists knowing they already had a leg up on scare value from acid rain alarm when true acidification of some lakes occurred, I too, thought it was unseemly of sceptics to go all in on the semantics of it. It is a decent descriptor of a direction or trend in pH. This is the form of critique we see all the time from serious warming proponents when they inappropriately label sceptics “climate deniers” and even “global warming deniers”. I believe sceptics actually were responsible for bringing even the hyper-warming types around to accepting a considerably wider swing to natural variation. Witness the ECS drop from the Pause during which CO2 rose over 30%. Nature joined the argument in spades with the “Dreaded Pause” lasting as long as the warming that had caused all the concern. Even this warming, for the most part, was a climb out from a 40 yr cooling slide that had some of the same worriers certain a man-made ice age cometh. Indeed 90% of the warming we clangor occurred begore 1940 when CO2 was about 280ppm. Yes , such banging on semantics (and more so threats and insults) is a ‘tell’ that the protagonist is low on powder. I don’t think it is unreasonable for skeptics to call the alarmists out for for using the term “acidification”. The term may be technically justifiable in circles of people who know that the actual pH changes are probably insignificant in terms of biological consequences, but it is deliberately used to try and frighten the much wider audience who might be scared by words or concepts like “acid”. Just as any mention of words like “nuclear” and “radioactive” have long been accepted as guaranteed scare-words, so too do “acid” and “acidification” elicit a response of fear and alarm. The more chemically-educated alarmists who use these terms so loosely in the MSM know exactly what they are doing, and so do a lot of people who read their words. Sorry, as a chemist, I can’t let this use of “acidification” stand. The word means “reducing the pH of a solution below 7”. No more, no less. If the final pH is above 7, the solution has not been acidified, by definition. A semantic it may be, but it is a ”loosing semantic” on the alarmist side of the debate. It is only an accepted convention to facilitate an argument. It is not accurate and therefore wrong to accept. No more argument. It is more honest to state what is actually happening, to promote a healthier debate. It always surprises me that those with better understanding of this ”Ocean acidification” claim, don’t correct it or at least clarify it like … ”We acknowledge that seawater is basic and cannot truly acidify” Acidification is meant as a scary term to the uneducated, because stating that the oceans are less Alkaline, does not sound so bad. I started reading here at WUWT in September 2008; we had just transitioned from POTS to DSL. Within weeks I had gone to the local university and acquired recent books from the profs of physics, chemistry, and biology. I had recent geology, and geography texts. Seawater pH was introduced, here or elsewhere, so using those recent texts as sources of terms and concepts, I used the web for much more directed reading. I also knew that fresh water readings are, in fact, acidic, and stream critters still have bones. Long story short: after a few hours reading, I realized seawater pH wasn’t an issue and have not paid much attention since. This is a nice summary today, and I thank you. JFH Correct. The problem is that OA is a simplistic summary equivalent to CC or GW as shown in letters and responses in the last American Scientist. In graduate school I helped a colleague work on an acidic spring with snails, and since worked with mollusks burying in nasty looking mud. So I have been less than enthused or worried about OA since, but much concerned about language. An old buried paper around here somewhere used OA in the title, actually pH<7, as it actually sometimes happens in the real ocean. Nowadays, any reduction of a basic pH is called acidification. That’s wrong outside of a coke bottle type experiment, especially considering what a weak acid it is. If that’s all they understand we have a problem as marine ecologists and toxicologists long ago discovered about experimental extrapolation failures. The result is complicated by what’s in the water and what’s in the critter. It’s mostly ignored (or not understood) in the “accepted linguistic convention” argument. It is not an “accepted linguistic convention” – it is a movement to redefine just anything: “marriage”, “free speech”, “gender”. “University” is no longer an institution of higher learning; it is now an institution of equity, safe spaces, diversity, and higher spending. They didn’t really need to bubble CO2 through boxes on the GBR. Could just have gone to Dobu. On the other hand, the AIMS people went to Dobu and did not report on what they found, so maybe the bubble boxes were needed. Martin Clark, you seem to ‘know’ the Fabricius’ scientific misconduct concerning Milne Bay, where Dobu Island was one of three sites surveyed for her paper. So for WUWT readers that have not bought my cheap ($7.99) Kindle ebook version [also available iBooks, Kobo, and all others], here is a very brief non pictorial summary. Milne Bay on Papau New Guinea is an active volcanic ‘rim of fire’ province. There are numerous volcanic seeps ‘leaking ‘ CO2. Fabricius surveyed 3 with delta pH. Ah, but the lowest pH Dobu Island seep was also leaking trace H2S (hydrogen sulfide) which is more toxic to most marine organisms than cynanide to mammels, for the same oxygen transport reason. So the horrifying ‘global warming ocean acidification’ Dobu example featured by Seattle Times is just a chemically poisoned bogus example. And her SI water samples prove she knew this. And, Bob Halstead features prominently in the essay example, also. The basic question is does increased CO2 lower the pH and if so (it does) is it a problem? Same with temperature. Does CO2 run up temperature and if so (it does) is it a problem? Getting bogged down in definitions of acid and the laws of thermodynamics is not productive. Arguing over these fine points with the other side is like wrestling with a pig in in a manure pile. After a while you realize that the pig enjoys it. Well, my goodness, just because someone else persists in using bad terminology, that doesn’t mean that pointing it out once in a while is losing an argument; just letting this pass every time might also be seen as losing the point! Uh, well no, a drop of 0.1 pH units is just that. You can calculate a 26% change in ion ratios if you wish, but this by no means implies that you’ve got 26% (or 30%) more *acid*. By the above ‘NOAA’ logic, a change of one full unit, anywhere on the scale, acid *or* basic, could therefore automatically mean that something is “ten times” as acid as before. Terminology matters, and the alarmists “standard” terminology of “acidification” always has been, and always will be misleading to the point of creating lies — like the “log scale means 30 percent more acid” meme! By the above ‘NOAA’ logic, a change of one full unit, anywhere on the scale, acid *or* basic, could therefore automatically mean that something is “ten times” as acid as before. Yes! Absolutely. What you describe is *exactly* how the pH scale works. In fact, every 1.00 unit change in pH corresponds to a 10x change in hydronium ion, *and* a 10x change in hydroxide ion as well. Still, I applaud Rud Istvan for raising the bar on what is a predictably tiresome WUWT food fight. No, saying that a solution “is “ten times” as acid (as compared to a given starting point) “because the hydronium ion concentration went up 10 times” is exactly how the pH scale *doesn’t* work! Say, If I start out with a solution of pH 8.0, (that’s one unit to the “basic” side of things, relative to 7.0 or pH neutral), what then happens to the available positive ion or hydronium concentration, if I titrate the solution and make the pH 7.0 exactly? Should I play coy here and ask the readers to provide the answer, or should I just say it straight out? Here’s the answer: in the example titration I am describing, you end up at a pH neutral value of 7.0, definitely making the hydronium ion concentration 10X what you started with, and again, ending up, in this example scenario, with a pH balanced solution, i.e. no basic or alkaline quality as such, and *no acidity* either. Notice here, that with absolutely *no* acidity, you *do* have a definite hydronium or positive “pH relevant” ion concentration, with that defining concentration being not at all the same thing as saying there is acid present! Contrary to the NOAA page reference that I gave, hydronium ion concentration should not be confused or conflated with “acidity”. Technically, what happens is you take the log of the concentration to get the “pH”; the pH in turn is the big insight number or useful number that can be used to define acidity. Again, note that the hydronium concentration is not itself anyone’s definition of acidity — or should I worry that the latest pH balanced shampoo might melt my scalp or something? the pH scale is one of convenience, hydronium concentration is, in fact, the parameter of interest. Define for me, the pH scale when ethyl alcohol is the solvent. (Yes there is such a thing), Now, let’s do methylene chloride. This is not just an academic exercise, it is an important topic for the synthetic organic chemists. With organic solvents, special cases abound. You have protic solvents, aprotic solvents, compounds with high dielectric constants, and low. Gives a whole new meaning to the word “neutral”. 1) When you titrate acetic acid with sodium hydroxide, you produce the conjugate base, sodium acetate. What is the pH of a solution of sodium acetate (at the equivalence point)? 2) what is the pH at neutrality? 3) What is neutrality for a conjugate system? 2) You are an idiot. David, when they say a change of 30%, they know that the full range is thousands of percent. At least I hope they do for their 200 grand a year. Thanks for the reply, Gary Pearse! In the meanwhile, I am responding here to TonyL’s latest reply ( replying to my earlier critique of the particular NOAA page that I found very misleading). TonyL calls me a “idiot”, a circumstance I find sort of revealing, in the sense that either he is just being mean, or else maybe *I’ve* managed to provoke him to a bit of exasperation somehow? Most likely the latter, as I know that I’ve thought of the famous Bill Nye in those terms at times — and it’s really just the exasperation that you get when you think someone is wrong! Comes to that, my own credentials as such are, in a way, I suppose, ‘just having gone to engineering school (similar to Bill Nye, say)’ . Further, I’ve never claimed to be “into” the more involved details of conjugate chemistry. Now, I’m well aware that a quick review of pH definitions is going to leave some things out. For instance, titration pH is actually a bit different from the nominal 7.0 depending on the *temperature* of the water solution. That is to say, the fundamental balanced or titrated pH number actually decreases to some value less than 7 if you go up in temperature above 0 degrees C. To the extent that anyone wants to mention potentially relevant complications like *that*, it is welcome information! Come to think of it, I’d be interested to know if most of the ocean numbers we see are actually temperature adjusted to make sure that the stated pH always relates to a nominal 7.0 neutral point (as that would seem to be the most practical way to judge the base vs acid property of watery solutions)? “Define for me, the pH scale when ethyl alcohol is the solvent. (Yes there is such a thing), Now, let’s do methylene chloride. Funny, last I checked, the ocean was fundamentally a water solution, not an alcohol based solution? Trying to sort this sort of thing out for actual relevance is way above my pay grade, so I give up. To sum up, I didn’t mean to annoy, but my essential point stands. Doing as the NOAA page I mentioned *does*, i.e., making it seem like slight changes in pH somehow make more “acidity”, even when the solution is *basic*, that’s pretty much unforgiveable, red herrings be damned! David, why don’t you and Tony resolve this by getting together and experimenting, i.e., consume some of his ethanol solution? Much more interesting than a solid food fight. Who wrote this and are you a scientist? Not a problem if you are not but it’s always a benefit for readers to know both items. Sessile calcified animal phyla such as coral, bryozoans, sponges etc. evolve and thrive. So what was the pH at 3000 and again at 10000? I hate stories where a few important pages have been ripped out of the book. But even then, seawater was alkaline to varying degrees. Horrible title. When I learned about titration in chemistry, we learned that adding a small amount of an acid to an alkaline solution was called NEUTRALIZATION. Nor is this some kind of obscure or newly invented terminology. Look at any textbook regarding titration and you’ll find the same term for adding either small amounts of a base to an acid solution, or a small amount of an acid to a basic solution—neutralization. The ocean is not being “acidified”, that’s rampant alarmist terminology. Sheesh … how many times do we have to go over this? I don’t know whether ctm or Rud is responsible for this abomination, but c’mon, guys … you’re playing right into the hands of the alarmists. Thanks, Dave. The “referents”? No idea what you mean by that. I do know that adding a small amount of acid to a basic solution is called “neutralization” in thousands of chemistry books. I also know that regarding the ocean the identical process, adding a small amount of an acid to a basic solution, is falsely called “acidification” to increase the alarmist shock factor. As below, I prefer ocean debasification, but neutralization is less wrong than acidification. In chemistry, neutralization or neutralisation (see spelling differences) is a chemical reaction in which an acid and a base react quantitatively with each other. In a reaction in water, neutralization results in there being no excess of hydrogen or hydroxide ions present in the solution. The pH of the neutralized solution depends on the acid strength of the reactants. Neutralization is used in many applications. But the ocean is NEVER going to become neutral, or anywhere near it. … and a tiny change in atmospheric CO2 almost certainly isn’t going to change pH in any measurable way. Just like it isn’t going to warm the atmosphere. I beg to differ. Seawater is an ionic solution. Lowering its pH doesn’t acidify that solution any more than did Willis’ high school chemistry class titration. But neutralization isn’t the correct term either. It strictly speaking doesn’t mean to make less basic or alkaline, but to bring a solution to a pH of 7.0. Appropriately, the proper term is “debasification”, which is why I said that consensus climate science has bebased language. I agree with commenter Bill that debasification sounds funny, even though the word has the same number of sydllables as “acidification”. But it has the advantage of being chemically correct and not designed as a scare tactic. That is how the term is used by scaremongers in on the scam. It is not how it was used before postmodern, advocacy “climate science”. Just because a term has been redefined and allowed into the technical literature does not mean that it is correct or desirable. Wiki is certainly not an unbiased authority on this! Most people agree that Wiki is useful as a first-search reference for technical subjects that are not political. However, the term “OA” definitely has political ramifications. I prefer debasing a solution when making it less basic and deacidifying a solution when making it less acid. That leaves neutralizing for when I make it neutral. It would be OK to use neutralizing as a process were the end result to be a neutral solution. Granted, Wiki, but relies on Fundamentals of Analytical Chemistry (8th ed.) as its source. The reaction here is the addition of CO₂, a weak acid. The strongest base that can “neutralise” it is CO₃⁻⁻, which is not strong like hydroxide. pH 7 has no role, and “neutralise” does not apply. Dave: The people who have defined the term “ocean acidification” and use it in the literature are the same people who don’t use significant figures. They’re not scientists. As John Tillman says, they’re scaremongers. Therefore sceptics are correct, it is a misnomer. And here at WUWTwe can combat them on their terms, WITHOUT always debating their terms. IMO. Wins count, NOT purist definitional rhetorical pseudopurist fake rhetoricsl ‘wins.’. Rud, you are correct that we can and should combat them on scientific terms. However, we should not call skeptics “deniers”. And we should not call global warming “global weirding”. Nor should we call ocean neutralization “acidification”. Why are you insisting on using their terms, terms which they have carefully chosen for their emotional impact in order to distort the discussion? What do you gain by that? When you start calling skeptics “deniers” and you start referring to global warming as “global weirding”, then I’ll believe your argument that you think the terms don’t matter. All the best to you, and thanks for an interesting post. I’m just very sorry you totally sidetracked it by using emotionally loaded terms in what should be a scientific discussion. Let me point out, Rud, that you could have taken the “timeworn loser argument” out of play entirely, completely, and thoroughly by just calling it “ocean neutralization”. Instead, you have brought the argument INTO play by your choice of words. It isn’t being neutralized. It isn’t a titration. And it isn’t a reaction between strong acid and strong alkali, which is what you do at school. The real issue is, how much does adding CO₂ increase the solubility of calcium carbonate, in a complex equilibrium of carbonate species. And it does increase the solubility, whether the pH is 8, 7 or 6. Nick, you know that the organisms create their own localized chemical regime. These creatures are not passive receivers of material that just precipitates on them. Were it so, plentitude would have overwhelmed them into carbonate sarcophaguses. Actually they even make fancy and delicate designs and color combinations while they are at it. I collected tiny white cephalopods 2-3mm in diameter in a Miocene ~20 million ybp lake bed in the Borate Hills, Nevada area filled with hotspring waters from which boron-lithium hydrous silicates crystallized in 10m thick beds interlayered with rhyolite volcanic ash. How they survived at all (or even got there! ), let alone actually pull together calcium carbonate from this calcium poor source is a wonder of the world. Actually my job was a chemical one, too. I designed a process for extracting lithium and boron from the deposit and making pure products from it. I give creatures who have evolved over a billion years in every imaginable and unimaginable inhospitable place a certificate of toughness they are never accorded by ecologists and biologists who seem to need a pep talk on their chosen subjects. They can do. But they have to work at it. And if they are to retain CaCO₃ in a low carbonate solution, they have to work harder. Maybe. Maybe not. As Latitude alludes to, that doesn’t mean there is a net energetic loss for them when one considers the relatively small pH changes associated with changes in CO2 concentration, and all the other processes they perform. The internal pH of cells (with the exception of a few organelles) is mostly lower (more acidic) than their surroundings, so “acidifying” the ocean should actually be a net benefit to them. And the photosynthesizers spend time and energy using carbonic anhydrase to INCREASE the availability of free CO2. They have been shown to decrease the amount of energy they devote to such processes when CO2 is increased. While it is certainly an interesting topic for discussion, the one-sided approach espoused by the ‘ocean-acidifiers’ does not speak to the view of dispassionate scientists. It is the alarmists, who you appear to support, who have a biochemical knowledge that does not appear to go much beyond high-school chemistry. How the heck is a first time visitor supposed to decipher that sentence ?? Well, they could ask … but your point is well taken. Jargon doesn’t further. Steve Mosher, thank you. Per our recent lunch with Charles the Moderator, will continue to try to elevate Watts Up With That. It matters because adding CO₂ removes CO₃⁻⁻ (carbonate), making it easier to dissolve CaCO₃. pH is just an indicator of where this equilibrium stands. And it is why the pH7 nonsense is particularly irrelevant. There is nothing special about that level. In fact, the pH that does matter is the pKa (9.13). This is the level at which [CO₃⁻⁻] and [HCO₃⁻] are equal, and is the optimum buffering level. Sea water is well on the acid side of this. Yes, it is. But because it is on the acid side of pKa, pH buffering effectiveness diminishes with acidification. It is worse than what linear extrapolation would suggest. True, “the pH of a natural water is not a reliable index of its ability to neutralize strong acids or alkalines. The shape of the curves in carbonate-system Bjerrum plots vary considerably depending on who is drawing them. However, the optimal buffering region is the bicarbonate plateau between about pH 7 and pH 10. The common range of pH found in nature is from about pH 5.5 (rainwater) to about pH 8.5 (alkali) waters. There is little evidence (according to Konrad Krauskopf) that ocean waters have ever been below pH 7, except in some anoxic, hydrogen sulfide-rich waters. The important point is that within the bicarbonate plateau, the change in pH will be resisted strongly with the addition of carbonic acid. Because the classic definition of of an acid is a solution with a greater concentration of hydronium than hydroxyl ions, the terms “acid” and “base” are still appropriate terms, regardless of what the carbonate concentration is doing. The math is simple, and the shapes shouldn’t vary, except for the use of linear or log scales, both of which have uses. The optimum isn’t a plateau at all. A simple buffer capacity is shown here. Capacity means by convention change of pH per mole addition of strong base, but it is the same for acid, and relative to the CO₃⁻⁻/HCO₃⁻ range, CO₂, is quite a strong acid, in the sense that it is almost all converted. So the plot is basically the same, and shows that if you step 1 unit of pH away from optimum, capacity is about a fifth of optimal. What is important is that, in the range for which the bicarbonate concentration is relatively flat, orders of magnitude change in CO2 have negligible impact on the bicarbonate concentration because the CO2 reacts with the carbonate IN SOLUTION. You said above, “It matters because adding CO₂ REMOVES CO₃⁻⁻ (carbonate),…” It would be more accurate to say that adding CO2 CONVERTS carbonate to bicarbonate, as shown by your equation. It isn’t removed from the system and is still available to organisms to make and repair shells. As long as the bicarbonate is created from carbonate ions in solution, and the sea water is in equilibrium, there should be little corrosive affect on the organisms in the local environment. What you and others are implying is the situation where the shells from dead organisms drift downward into deep, cold, waters, where there is a relatively low pH, and the introduction of additional calcium carbonate creates an opportunity for the unprotected shells to neutralize the excess CO2 and create bicarbonate. Only at a pH of less than about 5.5 will both carbonate and bicarbonate concentrations decline sharply, making the water corrosive to solid materials not in solution, in a simple carbonate system. However, the situation is more complex than you suggest because borate ions in sea water also partake in the buffering action. Stokes you tell a narrative that misleads via half truths. First most CaCO3 structures are protected from dissolution by an organic covering. Freshwater is about 5.5 pH and freshwater mollusk shells do not dissolve. The dissolution of CaCO3 is red herring. Second the very process of forming CaCO3 reduces alkalinity, adds CO2 and lowers pH. The lysosome is also an organelle into which H+ is pumped to substantially lower pH to perform digestion or destruction of molecules. Maybe this happens in mitochondria also? This makes me wonder if there is some ancestral link between all such organelles (chloroplasts, lysosomes, mitochondria) and the hypothesised (Lyn Margulies) endosymbiotic bacterium / archaean microbe – itself no doubt an acidophile. Mr Steele, perhaps you could link your posting name to your web site? Finally someone mentioning the Ka factor. Sulphuric acid (AKA acid rain from the real industrial pollutant SO2) is about 2.27 billion times stronger than weak carbonic acid (soda water) generated by CO2 – on the Ka scale – dissasociation constant. All acid rain ultimately runs into the oceans where it is neutralised without so much much as a blip in the oceanic pH. Man has been reducing his SO2 output over the last 30 years – such that the annual reduction in SO2 output represents more that all the CO2 acidification since we learned to rub two sticks together. Nitric acid generated by lightning strikes is a bigger threat than CO2. I’m not a chemist so I have probably got this all wrong but as yet no one has adequately explained it to me. Ah! OA and the unsettled science of Omega and other myths! How much worse ? ?, why worse ? ?, care to define “worse” ?? It is defined by the context, which is the pH response to CO₂. Buffering gets weaker, so the pH responds more. But as I said, this isn’t the effect that matters. So it is a benign kind of worse. So, you were just telling a scary story that exposed limestone couldn’t counteract ? Exactly. Until all of the limestone exposed on the earth’s surface dissolves away, ocean acidification is just another imaginary climate problem. Given the vast amount of limestone exposed on the earth’s surface, the supposed decrease in ocean pH may well correct itself. But ask yourself (and ask climate scientists as well), how did all that limestone form in the first place? Limestone is ~45%+- CO2. Don’t forget to mention basaltic rocks. A HUGE buffering source. Everyone know the White Cliffs of Dover and limestone, but how many know of the Nullarbor Plain. I’ve heard that this limestone is 30m thick, I don’t know any differently. This article says the plain is 200,000sq.km. It is worse than what linear extrapolation would suggest. I keep reading that CO2 levels over geologic time have varied immensely. So if I were to believe your assertion there were times in the past where it was worse – whatever that means. I agree. For most of geologic history, oceans have been alkaline, even under much higher levels of atmospheric CO2, thanks to buffering from continental weathering and other processes. A model used by researchers at the Weizmann Institute and Stanford last year concluded that Hadean and early Archaean Eon oceans might have been slightly acidic, but different assumptions produce different results. IMO however students can have some confidence that for at least the past three billion years, Earth’s oceans have been alkaline. “Programmers” might be more accurate than “researchers”. But before extensive continents and mountain ranges, it’s not unreasonable to assume that ocean chemistry might have been different. There was however a lot of iron dissolved in Archaean seas. But now, CO2 rules them all! And why are Nick’s comments “assertion without evidence”, but the many others on here are not pray? As if I didn’t know BTW. I think that like so many other agw scares, the ocean acidification thing is a failed attempt to draw a parallel between agw and prior climate extremes, in this case, the PETM. Two links below with details. You have a very useful data resource on the PETM! I think that Jim Steele’s links are well worth reading! The Mauna Loa pH trend dropped after the 1998 El Nino. The trend published in a Monterey ocean symposium and then by Obama on climate assessment have two different trends. They are offset. Measuring pH accurately with carbonate present appears to be the closest thing to finding God you can achieve, the impossibility is so high and the ion exchange that results is so complex. The World Ocean being saturated in carbonate makes pH measurement a serious problem. If you think you are going to measure electrical potential for pH with carbonate present, you don’t know chemistry very well. If the ocean has more CO2, then it will precipitate carbonate as oolites, and less, the carbonate ooze shelf sea floor should dissolve (slowly). Ocean pH is at 8.3 due to buffering, which makes changes essentially impossible. In past geologic episodes of high CO2, the ocean dumped massive beds of oolitic carbonate on sea shelves, a process that stopped in the modern era that used to be called the “carbonate problem” is geochemistry. Chemists might disagree. Adding a weak acid to a stronger alkali partially neutralizes the solution. Neutralization is not acidification. The acid combines with the alkali to form a salt. The salt may be soluble or insoluble, and therefore might stay in solution, or precipitate out. If it stays in solution, the solution will still be ionic at pH7. However if it precipitates you will be left with pure water. Either way there is no acid present in the solution until the alkali has been exhausted. Only alkali and salt. The misconception probably arises from the assumption that you have a mixture of acid and alkali in the container. You don’t. You have a compound. A reaction product. I agree that arguing about the linguistics is a losing argument for skeptics. Indeed Ken Caldeira admits choosing the term ocean acidification to scare people. Still is an established use of acidification. For example, human blood should be around 7.4. The medical community will label a pH of 7.35 or lower as acidosis and a pH of 7.45 or higher as alkalosis, even though those pHs or all alkaline. An example of ‘loose terminology’ in electronics is the claim that an amplifier stage causes a ‘hundred and eighty degree phase shift’ when in fact signal inversion is what is meant. This used to be found in textbooks and college lectures and was extremely confusing for any student who wanted to properly understand the subject. It led to students trying to figure out where the mysterious time delay was arising from (and how this time delay always magically equaled one half cycle, regardless of frequency!) Which in turn led them to thinking that this was something to do with the transition frequency, miller capacitance or suchlike. In other words it caused them to waste hours of their time on a futile line of research. Lecturers could get away with using this term if all tests were done with sinewave signals, because this is a special case where phase shifting and inversion look much the same on the ‘scope. As soon as a test is done with an asymmetric waveform though, the wrongness of the term becomes apparent. In science, it is important to be accurate in our descriptions. Once an inaccurate term is allowed to get lodged in the textbooks it becomes hard to stop its use, and all sorts of false conclusions and dead-end research will arise from it. Which is why the theory of CAGW is not the theory of climate change. CAGW is a far more accurate definition of the alarmist claims, both in the media and in the so called science. No problem with calling it “Ocean acidification” at all. As long as you admit that distilled water is orders of magnitude more “acidic” than ocean water. Good point. I’d wear rubber gloves handling that stuff if I were you. I’d give that comment a “+10”, but I’m afraid someone might accuse me of breaking the Internet, multiplying my “thumbs up” response by a factor of ten billion like that . . .
Beautiful comment which reveals the vacuity of the Ocean Acidification scare! Christmas is a time when Alarmists gather together, roast chestnuts, and share memories. – They tell their children how there used to be a cold white substance, called snow. – They reassure their children that Santa really does exist, and that he delivers presents to all of the good children (the ones who believe in global warming). – And they give thanks for the 97% consensus (that global warming is real, that it is caused by humans, and that there was no recent slowdown). In keeping with the true Christmas spirit, Alarmists have just published 2 new papers, which (they say) demonstrate convincingly that the recent slowdown wasn’t a real phenomenon. It is a pity that they didn’t read my article first. They could have saved themselves a lot of time, and millions of dollars (of your money)!!! Warning – this article contains undeniable proof, that the recent slowdown WAS a real phenomenon. So if you want to continue believing that the recent slowdown doesn’t exist, then don’t read this article. If, as the AGW theory goes, increased atmospheric CO2 leads to increased warming then there should also be a counteracting tendency for oceans to warm, and thus give up CO2. All things being equal CO2 would rise in both atmosphere and oceans to balance out, but all things are not equal if we assume CO2 warms the planet up. What would be the interplay between the two factors of rising general CO2 levels and rising temperatures? Other than under the deep oceans where most of the worlds volcanoes are spewing acidic conditions, I wonder if anyone can tell us where the oceans are acidifying? I’m prepared to take a bet that the sea is not getting acidic anywhere around the world… from the coasts of Australia to the islands of the Caribbean… from the Fjords of Norway to the China Sea. Why the hell are people using this fake expression “ocean acidification”? Sea water pH average at Mauna Loa is not reliable for extrapolation because pH is affected over time in Volcano, and underwater Volcano territory. Interesting to look at it compared to pH data from Flinders Reef. If you dissolved all the atmospheric CO2 in the oceans there would be an immeasurable change in ocean ph value. Basically every river that flows into the oceans is acidic, even down to pH 5.5, and yet over any know time span, the ocean has remained steadfastly alkaline at around 8+ pH. The whole “ocean acidification” farce is a load of anti-science nonsense. There is an easy way to determine whether acidification of a high-volume, high-density, highly buffered and turbulent system by atmospheric CO2 is feasible, and that is to compare its pH to that of a shallow, low-volume, relatively calm and unbuffered fresh water pond and lake system. It should be obvious that the latter would be a virtual acid bath well before any ocean system showed meaningful changes in pH. Also, notably, the article did not address localized and temporary changes in pH due to submarine volcanic activity, which comes to mind when papers publish data on ocean acidification localized near the Pacific Ring of Fire. I don’t know for a fact that atmospheric CO2 is that important to ocean pH. My view is that of a limnologist. The organic content in most fresh water streams makes them acidic. Land runoff into the oceans would lower the pH of the surrounding waters. I can’t quantify the effect, nor the atmospheric CO2 effect, so I don’t know which is bigger. I can say the atmospheric CO2 isn’t acting alone. And that’s about it, even at Christmas. Michael: thanks for the global warmer’s chemical viewpoint – it gave a good laugh. Sadly, I think you’re right. The article perfectly describes the biological aspects of the problem of acidification of sea water. I would like to briefly discuss the question of whether an increase in CO2 concentration in the atmosphere can significantly affect the acidity of seawater. The concentration of CO2 in sea water is very low. Extrapolation of data by J.Carrol et al (1991) https://www.researchgate.net/publication/253858692_The_Solubility_of_Carbon_Dioxide_in_Water_at_Low_Pressure to the partial pressures of CO2 0.03 kPa and 0.04 kPa at 20oC gives the values of solubility 12.8 and 16 micromole CO2/kg H2O correspondingly. This means that the increase in CO2 concentration over the past 100 years was only 0.13 mg/kg. Can such a change in concentration affect the pH even in the absence of buffer salts? In other words, only one CO2 molecule from 830 is converted to carbonic acid. The equilibrium constant for stage (2) [H+] [HCO3-] /[H2CO3] = 0.00025. Consequently, the concentration of hydrogen ions formed in water due to CO2. is negligible, and other reasons for the change in seawater acidity need to be considered. Here’s my conjecture – others more able than me can check the numbers. Let me offer some perspective. Folks keep talking like the expected changes in alkalinity are large. Let me start with my local situation on the coast of California. pH measurements at the inlet pipe to the Monterey Bay Aquarium. Inlet depth is 50′ (15 metres). Light yellow hairlines show standard error of each month’s measurements, indicating a wide spread of pH values in each month. 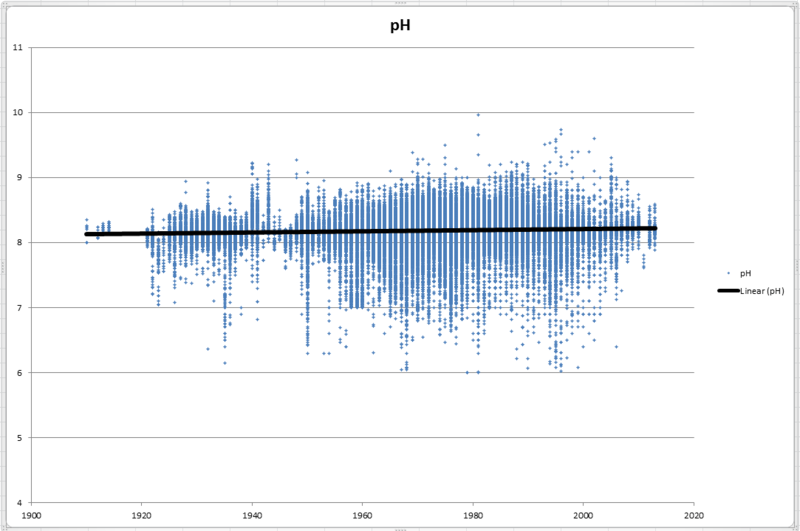 Red interval at the top right shows the theoretical pH change which would have occurred over the time period of the dataset. Photo shows kids at the Aquarium looking at the fish. 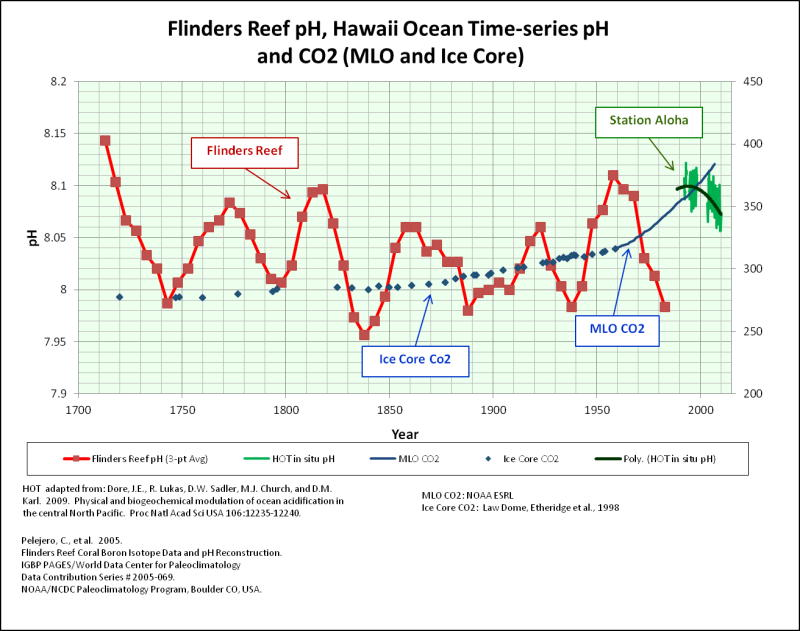 Heck, over coral reefs the pH can change by 0.2 pH units in SIX HOURS … and per the head post, “IPCC AR5 3.8.2 suggested that doubled atmospheric CO2 might cause surface pH to decline by Δ 0.15-0.2 …”. Finally, we tend to think that the ocean all has the same pH … not true. pH in the ocean around Alaska is about 8.05 … and in the ocean around Hawaii it is on the order of 7.65. So no, I am not concerned that a slight neutralization is going to even be noticed by the ocean creatures. Let me offer some perspective. Folks keep talking like the expected changes in alkalinity are large. So the H+ is only a very minor contributor to alkalinity. If you want to call it something other than pH just call it hydrogen ion concentration. I think that it should be noted that the Monterey Bay Aquarium is situated at the head of the Monterey submarine canyon. The area is noted for frequent and erratic upwelling of the water. The reason that the aquarium started monitoring the intake was because they had lost specimens when the upwelling water was anoxic. 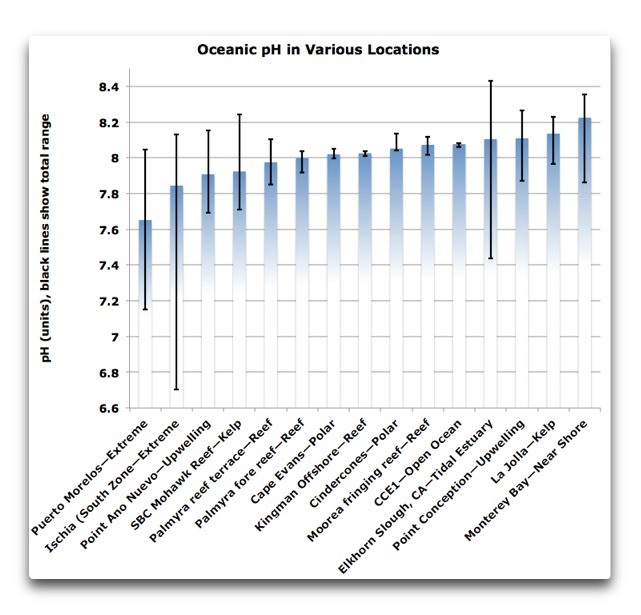 The bottom line is that the variance in pH at the aquarium results from low-pH water coming from great depths, and is not typical of what occurs in areas that lack significant upwelling. That is, low-pH water is more common in upwelling zones. So, a late maybe dead thread set of final comments on my simple guest post. I tried to defuse the semantic pedantic ‘acidification’ quibble at the outset. Failed abjectly. But that failure teaches IMO a much bigger skeptical failure. No different than prolife means actually antiabortion. If you lose the popular terminology symbology, stop fighting a lost battle and move on. The battle is political for genersl populace minds. Not static. Not purist. 1. Seawater is highly buffered, so all the alarmist ‘acidification/neutralization/debasification projections are physically (chemically) impossible. See how silly word games are in the greater chemical debate context? That is a warmunist killer biological argument. Kudos, Jim Steele. So, the next time an all knowing commentator on your favorite MSM news outlet announces how the water is getting more acidic at an alarming rate, are you going to answer with a somewhat oblique truth about mollusc coatings, or are you going to answer with the more direct truth that there is no acid/acidity in the water at all? Maybe it is OK if both those truths are brought forward to the extent possible? To put it another way, what makes you think that the “there’s more acid all the time” promoters are OK to win, it’s good to go for *that* idea, while the more subtle truth about the ability of the wilderness to adapt to even relatively large changes over time, why *that* is going to put the alarmists in their place, they would *never* lie about *that*! If I’m putting some in here it is only because we’re still facing a genuinely alarming situation of the eco-extremists in our society seizing the air of authority, broadcasting their alarm from the chairmanship positions of most of the world’s science organizations, and all of this with the hearty support of the mainstream/leftstream media! If the most basic “spin” or “slant” terminology in support of alarm is therefore somehow held to be a lost cause, unchallengeable really, then aren’t the more subtle points of anti-alarm sure to be lost as well? “We acknowledge that seawater is basic and cannot truly acidify (pH<7). But that is a losing semantic quibble, not a winning skeptical argument"
Since when is the truth a mere quibble, and since when is a lie to be fully accepted as the presumably valid or unbiased terminology that everyone must necessarily work with? Go right ahead and use the word acidification in the alarmist context, but please don't go out of your way to excuse it either. Several years ago, I visited the Monterey Bay Aquarium. One of the docents was excited enough about OA to tell us that Scripps Institute was about to launch several autonomous mini subs which would cruise the oceans taking measurements. She pointed out that one of the items that these vehicles would measure would be pH and she went on to explain how this data would show the impact of OA. When I heard this, I began thinking that the data would most likely show that there are wide variations in ocean pH levels (diurnal, seasonal and local). Based on the routes these vehicles take they might find pH trends in either direction or possibly no discernable pH trend. Recently I searched for this data, but I have not found it. Does anyone have a link to this data? See my comment above, along with my posts on the subject (below). What I would like is contextual numbers for how much CO2 there is in the oceans, in the atmosphere, and in the lithosphere, so that the changes can be given relative scale and hence significance. I feel that if the things are put ob ne a comparable global scale the realities can be discussed more rationally.